Been getting beat up by Real Life(tm) for the last several weeks, so there hasn't been time for hobby stuff of late. Snatched an hour after work today however and banged out the base red on a trio of heavy support units! 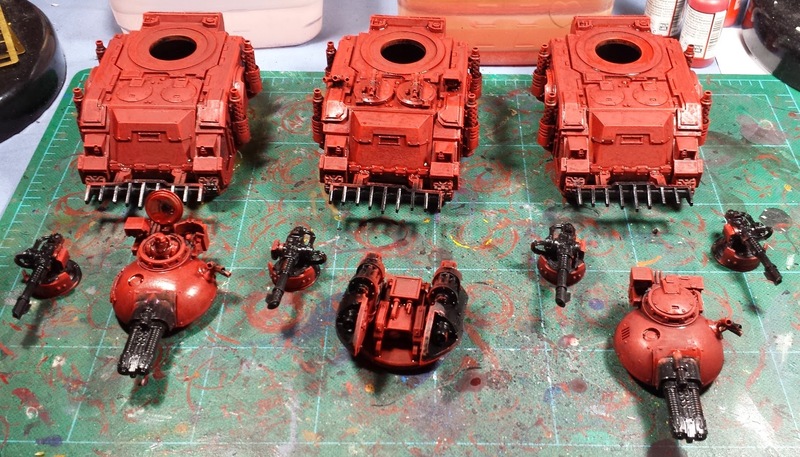 Standard red recipe - Dark Flesh basecoat, heavy drybrush with gory red followed by a lighter drybrush of blood red, and then the whole shebang gets a wash of carroburg crimson. These will need to dry for a while, but next up will be the bone color step. Going to be doing the various inset panels on the front and sides of the rhino chassis, as well as the weapon housings on the turrets - looking forward to getting stuck in! All that in one hour? Impressive. I've gotta get some of whatever juice you are drinking. You sir, are coming to Adepticon next year. @Damn The Valley: Thanks! Looking forward to seeing what you come up with! @Miniature Tim: Hah! Would love to, really hoping that the Prospero book is available by then. Regardless I'll have a viable Thousand Sons army of one form or another done in time. @Aventine: Thanks! I love the model, and it's frankly terrifying on the tabletop. Would love to see one done up in the Alpha Legion scheme you've been working on!